This amused me. It might amuse you too. The other night Ed Yong asked on Twitter if anyone could remember mention in a recent blogpost of the fact that salts of arsenic often contain phosphate. I’m guessing he was preparing for his latest #arseniclife post (which — to be serious for a second — is refreshingly candid about his initial treatment of all this arsenic-munching bacteria brouhaha). I thought I had read a note about the phosphate content of arsenates on Rosie Redfield’s blog, but I was mistaken. Then I wondered about looking up sodium arsenate on the web-site of Sigma-Aldrich, purveyors of fine chemicals to the world’s scientists. I remembered that they often included analyses of the most common contaminants of their products. The page I got to is shown below — unfortunately it doesn’t report on the contaminating salts. But it does reveal something quite interesting. Sigma-Aldrich have gone a bit, um, Amazon. You will see towards the top that the site invites you to write a review. What a great product! Had been feeling peckish and was delighted to come across this product at Sigma-Aldrich. Was impressed with the speedy delivery and the quality of the salt. Really great taste with none of the nasty phosphatey residue that you get with cheaper products. Shared it with my buddies at the lake who all agreed it was awesome! 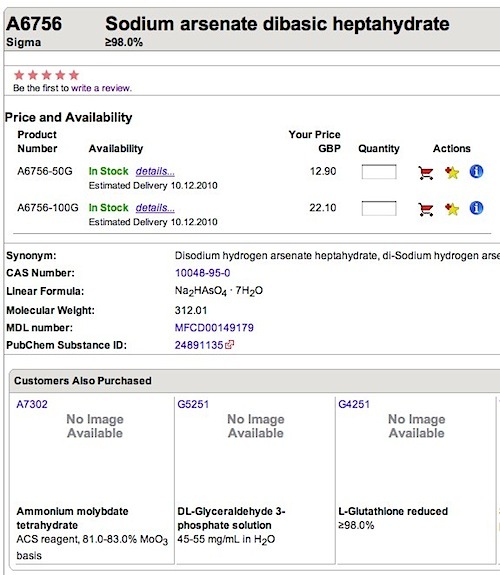 And not only do Sigma-Aldrich want reviews; they are now also suggesting additional purchases based on your selection. At first this seemed a bizarre innovation for a site dedicated to hard-working, focused scientist shoppers. But then I wondered what would be the impact if Sigma-Aldrich were to adopt a random chemical selector to generate these suggestions? Who knows what uncharted zones of chemistry might be discovered! This entry was posted in Fun, Science and tagged arsenic, chemistry, sigma-aldrich. Bookmark the permalink. Hahaha I hadn’t noticed that! Wouldn’t it be wonderful if they had a “like” or “share” button though. They could go social media mental if they wanted to! (BTW – welcome to the new place, Nicolas). Sigma-Aldrich is well-known as a vendor of such interesting substances as cocaine hydrochloride, alpha-cobratoxin, pheromones and “dog fear scent training essence” (or words to that effect). Just imagine the review possibilities! I am very saddened that there is no image available for the chemicals. I never buy anything off of amazon without seeing all the previews! @Kevin – a very sensible approach. On your behalf I checked whether Amazon stocks Sodium Arsenate. I’m interested to know whether the book Homeopathy for horses is very popular in the equine community? You don’t see many horses in our local bookshop, nor even many Houyhnhnms. Re. social media and procurement, I was talking to David Kavanagh at Science Online, He is from Scrazzl which aims to bring social media into lab procurement, helping labs to share knowledge and maybe even reagents. It does make some sense. Their website wasn’t very informative last time I looked and I think they are still in fairly early stages. Ah yes – now that you come to mention it, Frank, I remember hearing about Scrazzi at the Science Online conference. I agree it’s a very good idea – it’s just the sort of information that people share at conferences or by email. Brilliant, Stephen! This could be the next three-wolf-moon shirt phenomenon! Ha – luckily for me, I have no need of such shirts! haha – reviewing as an option for buying chemicals. Never seen that (or never thought about it anyway… but I would think I haven’t seen it last time I bought stuff from Sigma…. surely I would’ve noticed). As for the As discussion, I’ve tried to stay out of it since part of it seems to focus on other things that the bacterial stuff I find a bit interesting and troubling (doubling time in bacteria growing in non-great media for example)…. Why stay out of it if you have genuine concerns? It’s an interesting report but, to my mind, Science was a bit premature in publishing. I’ve had a go at reading the paper but was unconvinced of the strength of the evidence that As was truly incorporated into the DNA backbone. Rosie Redfield’s post raise a lot of tough questions. then that evidence needs to be pretty bloody good. It is nevertheless a fascinating episode – one to keep an eye on. And you can do that via the Guardian’s story tracker. 🙂 And welcome to Occam’s Typewriter Anthony. I didn’t feel like I could contribute too muich more than was already said… I liked Renfield’s comment, although I would have kept the small snide remarks in the middle of it away since it opened up to all these “you are just jealous” etc… but I am usually very specific?sensitve? (can’t find the specific word I’m loooking for… overly scared to be misinterpreted?) in my critique. Thanks for the link to the Tracker! Much appriciated! …and of course I mean REDFIELD. I knew there was a reason the name felt familiar…..
1. Was it not strange to find that the DNA samples of bugs grown in Arsenate only contained about 4% As (i.e. 96% phosphorous)? 2. Why did the editors and reviewers allow the very strong statements about incorporation of As into the bug’s macromolecules when the data in the paper didn’t convincingly nail this point? But I digress. I think in fact that this has been a good episode for science because it shows the level of criticism that findings can be subjected to. I hope the climate change deniers and alt. med. supporters are looking on because it should be clear that ‘Science’ is *not * a gigantic conspiracy. I agree with your 1& 2. I think it can be a good thing to show that scientist don’t always agree with eachother – although, for many poeple that makes things even more scary. (Take the vaccination discussion with some MD/PhDs on one side and MD/PhDs on the other side….) But yeah, there is always hope that some people will realize that there is not a conspiracy… hope and all…. Not sure what vaccination discussion you are referring to. MMR? But I guess when it comes to issues that have a direct impact on the public (not the case with #arseniclife), it is important for scientists to take care about the presentation of what is known. If there is uncertainty, that makes things more difficult, but there is no case for shirking that responsibility (he said, pontifically). Stephen – this is too chortlesome. As for the vaccination I was actually thinking about last year’s H1N1 and the adjuvant discussion that occurred in some European countries (esp. sweden and other mass-vaccination places). Pretty sure it’s fine to link, chall — have been doing it for the past couple of years without receiving a writ! — and makes life a lot easier for the reader. The piece you linked to is the commentary on the original paper (available for free for a couple of weeks). There was another press conference about the paper this evening – this time with the senior author, Oremland, who was answering questions. Can’t find the link at the moment but there was a pretty good twitter track from @alexwitze a couple of hours ago. Afraid I missed the H1N1 adjuvant discussion! Ah… I thought as much with the link! I look forward to it. Please ping me when it comes out. Great site. A lot of helpful info here. I am sending it to several friends ans additionally sharing in delicious. And of course, thanks in your effort! @drugmonkeyblog @deevybee “the great satan”. Dear me.